What Does an Occupational Therapy Assistant (OTA) Do? An occupational therapy assistant (OTA) works with an occupational therapist (OT or OTR) to treat patients who have difficulty performing daily living and work activities due to illnesses, injuries, and disabilities. 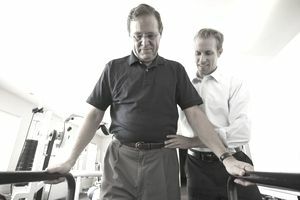 He or she helps clients perform exercises as specified in a treatment plan and teaches them how to use equipment that may make some activities easier. An OTA works under an OT's supervision and, if state law permits, helps develop treatment plans. He or she also does some administrative tasks, including recording patients' progress. An OTA's salary varies based on the individual's level of experience. Additionally, education, area of expertise and certifications also affect pay levels. In addition to a high school diploma, you will need to meet additional educational and licensing requirements. Education: You will need an associate degree from an occupational therapy assistant program that is accredited by the Accreditation Council for Occupational Therapy Education (ACOTE) to become an occupational therapy assistant. Some community colleges and technical schools offer these programs which are usually two years long and combine classroom study with clinical fieldwork. See the American Occupational Therapy Association website for a list of accredited programs. License or certification: Most states regulate occupational therapy assistants. The credentials go by different names, depending on the state. Most call it a license, but others refer to it as registration, authorization, or certification. Regardless of the title, eligibility usually requires graduation from an approved program—usually one accredited by ACOTE—and passing the COTA (Certified Occupational Therapy Assistant) Exam, which is administered by the National Board for Certification in Occupational Therapy. To find out the regulations for the state in which you want to practice, see the Licensed Occupations Tool on CareerOneStop. Additional certifications: Some employers may want or require you to hold a current certification in cardiopulmonary resuscitation (CPR). Compassion: OTAs must have a strong desire to provide physical and emotional support. Interpersonal Skills: The ability to interact with patients and their families, team members, physicians, and other health care professionals is essential. You need excellent social skills, as well as superb listening and speaking skills. Physical Strength: You must be able to help lift patients, and kneel, stoop, and stand for a significant part of your day. Attention to Detail: The ability to precisely follow a treatment plan an OT has developed is imperative. This field has an excellent job outlook and employment is expected to grow significantly faster than the average for all occupations between 2016 to 2026. Because of this, the U.S. Bureau of Labor Statistics classifies it as a "Bright Outlook" occupation. According to the government entity, the outlook for occupational therapy assistants over the next decade relative to other occupations and industries is much faster than the average growth for all jobs, driven by the needs of an aging baby-boomer population. Employment is expected to grow at about 29% over the next 10 years, which is much faster growth than the average for all occupations between 2016 and 2026. Growth for occupational therapy aides, a position that supports occupational therapists and assistants, is projected to grow slightly slower, at 25% over the next ten years. These growth rates compare to the projected 7% growth for all occupations. Job candidates with experience working in a healthcare setting such an occupational therapy office have the best job prospects. Most OTAs work in occupational therapists' offices or the offices of physical therapists, speech pathologists, or audiologists. Nursing care facilities and hospitals employ others. Some work for schools and home health care agencies. Jobs in this field are typically full-time. To accommodate patients' schedules, OTAs sometimes work evenings and weekends. Look for job openings at resources like the American Occupational Therapy Association's JobLink online career center, job listings on individual healthcare company websites, or more general job-search sites like Indeed.com, Monster.com, and Glassdoor.com for the latest job postings. Look for occupational therapy assistant volunteer opportunities through camps for people with disabilities, such as Easter Seal's camp. You can locate other opportunities through the Special Olympics or local chapters of disability advocate or rights organizations such as Wounded Warriors project, JDRF, Autism Society, and others. Get guidance and expand your skills by "shadowing" an experienced occupational therapist. You can find occupational therapy assistant internships through online job search sites and occupational therapy school career centers.